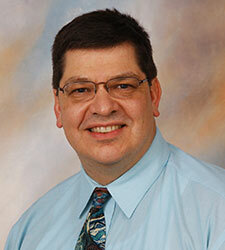 The American Academy of Family Physicians (AAFP) Board of Directors selected John Brill, MD, MPH, a teaching faculty member at the Aurora Family Medicine Residency Program in Milwaukee and a clinical adjunct professor at the University of Wisconsin School of Medicine and Public Health (SMPH), as the winner of its 2017 Exemplary Teaching Award for Full-Time Faculty. The award recognizes an AAFP member who has demonstrated exemplary teaching skills as well as implemented outstanding educational programs and/or developed innovative teaching models. The AAFP board specifically commended Dr. Brill for his compassion and dedication in shaping the next generation of family physicians. “Over the years, you have thought outside the box using humor to relate important points of clinical care and practice management…” wrote AAFP President John S. Meigs, Jr., MD, FAAFP, in his award letter. Specifically, he has mentored third- and fourth year SMPH students in the TRIUMPH project “Chronic Illness Management in Teams of Urban Multidisciplinary Scholars (CIMTUMS).” In that project, teams of interprofessional students and faculty work with diabetic patients at Milwaukee’s Aurora Healthcare Midtown Clinic to develop patient education materials and conduct group patient education sessions. He was also the founding medical director of the Clarke Square Family Health Center, a unique interprofessional practice located within a retail grocery complex in the most ethnically diverse zip code in Wisconsin. Congratulations, Dr. Brill, on this great honor!